Valdettaro is one of those names that quite rightly make up the history of Italian sailing, a company that was initially set up in Le Grazie (SP) with a boatyard where numerous prestigious boats have been restored to their original splendour and a marina, located in Fezzano (SP). Backed by this experience the company made the decision to acquire an area of about 40,000 sq./m, offering 10,000 sq./m of covered surface with the possibility of expanding by another 3,000 sq./m. The covered area includes a shed of about 7,000 sq./m with an internal height of over 20 m, a building of about 700 sq./m used for workshops and tool storage and a three storey block of offices of about 2,000 sq./m. All this is situated in the industrial zone of Massa-Carrara, in the area being reconverted and it is particularly suitable for operators in the sailing sector as it is just 3 km from Marina di Carrara and has good links with the main cities in the North of Italy. Thanks to its favourable position and the equipment owned by Valdettaro Shipyard, the company has become a point of reference for owners of yachts up to 45 metres in length for refitting, laying- up, ordinary and special maintenance such as fitting out and important alterations. 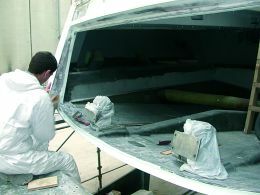 Services offered by Valdettaro Shipyard, operating in partnership with Marina del Fezzano and the Cantiere Valdettaro, range from mechanical, electrical and electronic assistance to wood and metal carpentry, repairs to hulls in fibreglass, wood and metal, offices or mini-apartments for rent, painting of hulls and interiors in controlled temperature surroundings, sail and soft furnishing services, used oil disposal, storage for sails and on-board materials, fire-fighting services and used battery disposal. 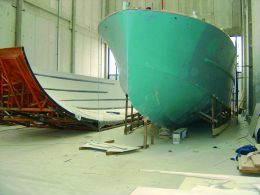 Activities carried out by the company also include reworking of hull bottoms, teak decks, contract work on moulds, custom constructions, fitting out of interiors and osmosis- fighting repairs. In other words, a real nautical centre for important boats, situated in what can quite rightly be considered the cradle of great Italian sailing, the zone around Viareggio and the province of Massa-Carrara. For further information please contact: Valdettaro Shipyard; via Massa Avenza 85; 54100 Massa (MS); tel. 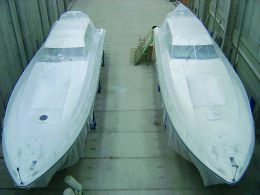 +39 0585 51584; fax +39 0585 855790; e mail shipyard@valdettaro.it; website www.valdettaro.it.